The history of American football can be traced to early versions of rugby football and association football. Both games have their origin in varieties of football played in Britain in the mid-19th century, in which a football is kicked at a goal or kicked over a line, which in turn were based on the varieties of English public school football games. American football resulted from several major divergences from association football and rugby football, most notably the rule changes instituted by Walter Camp, a Yale University and Hopkins School graduate who is considered to be the "Father of American Football". Among these important changes were the introduction of the line of scrimmage, of down-and-distance rules and of the legalization of interference. 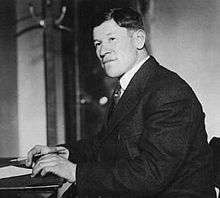 In the late 19th and early 20th centuries, gameplay developments by college coaches such as Eddie Cochems, Amos Alonzo Stagg, Parke H. Davis, Knute Rockne, and Glenn "Pop" Warner helped take advantage of the newly introduced forward pass. The popularity of college football grew as it became the dominant version of the sport in the United States for the first half of the 20th century. Bowl games, a college football tradition, attracted a national audience for college teams. Boosted by fierce rivalries and colorful traditions, college football still holds widespread appeal in the United States. 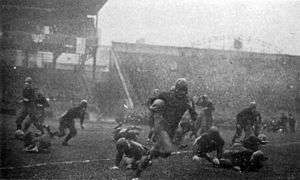 The modern era of American football can be considered to have begun after the 1932 NFL Playoff game, which was the first American football game to feature hash marks, the legalization of the forward pass anywhere behind the line of scrimmage, the first indoor game since 1902, and the movement of the goal posts back to goal line. Other innovations to occur immediately after 1932, were the introduction of the AP Poll in 1934, the tapering of the ends of the football in 1934, the awarding of the first Heisman Trophy in 1935, the first NFL draft in 1936 and the first televised game in 1939. Another important event was the American football game at the 1932 Summer Olympics, which combined with a similar demonstration game at 1933 World's Fair, led to the first College All-Star Game in 1934, which in turn was an important factor in the growth of professional football in the United States. American football's explosion in popularity during the second half of the 20th century can be traced to the 1958 NFL Championship Game, a contest that has been dubbed the "Greatest Game Ever Played". A rival league to the NFL, the American Football League (AFL), began play in 1960; the pressure it put on the senior league led to a merger between the two leagues and the creation of the Super Bowl, which has become the most watched television event in the United States on an annual basis. Forms of traditional football have been played throughout Europe and beyond since antiquity. Many of these involved handling of the ball, and scrummage-like formations. 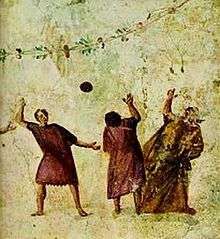 Several of the oldest examples of football-like games include the Greek game of Episkyros and the Roman game of Harpastum. Over time many countries across the world have also developed their own national football-like games. For example, New Zealand had Ki-o-rahi, Australia marn grook, Japan kemari, China cuju, Georgia lelo burti, the Scottish Borders Jeddart Ba' and Cornwall Cornish hurling, Central Italy Calcio Fiorentino, South Wales cnapan, East Anglia Campball and Ireland had caid, which was an ancestor of Gaelic football. These archaic forms of football, typically classified as mob football, would be played between neighboring towns and villages, involving an unlimited number of players on opposing teams, who would clash in a heaving mass of people struggling to drag an inflated pig's bladder by any means possible to markers at each end of a town. By some accounts, in some such events any means could be used to move the ball towards the goal, as long as it did not lead to manslaughter or murder. Sometimes instead of markers, the teams would attempt to kick the bladder into the balcony of the opponents' church. A legend that these games in England evolved from a more ancient and bloody ritual of kicking the "Dane's head" is unlikely to be true. These antiquated games went into sharp decline in the 19th century when the Highway Act 1835 was passed banning the playing of football on public highways. 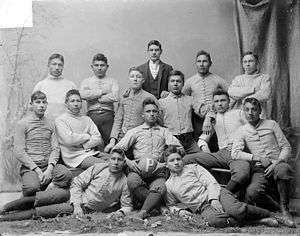 Although there are some mentions of Native Americans playing football-like games, modern American football has its origins in the traditional football games played in the cities, villages and schools of Europe for many centuries before America was settled by Europeans. Early games appear to have had much in common with the traditional "mob football" played in England. The games remained largely unorganized until the 19th century, when intramural games of football began to be played on college campuses. Each school played its own variety of football. Princeton University students played a game called "ballown" as early as 1820. A Harvard tradition known as "Bloody Monday" began in 1827, which consisted of a mass ballgame between the freshman and sophomore classes. In 1860, both the town police and the college authorities agreed the Bloody Monday had to go. The Harvard students responded by going into mourning for a mock figure called "Football Fightum", for whom they conducted funeral rites. The authorities held firm and it was a dozen years before football was once again played at Harvard. Dartmouth played its own version called "Old division football", the rules of which were first published in 1871, though the game dates to at least the 1830s. All of these games, and others, shared certain commonalities. 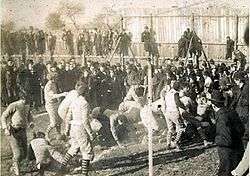 They remained largely "mob" style games, with huge numbers of players attempting to advance the ball into a goal area, often by any means necessary. Rules were simple, violence and injury were common. The violence of these mob-style games led to widespread protests and a decision to abandon them. Yale, under pressure from the city of New Haven, banned the play of all forms of football in 1860. On November 6, 1869, Rutgers University faced Princeton University (then known as the College of New Jersey) in a game that was played with a round ball and, used a set of rules suggested by Rutgers captain William J. Leggett, based on the Football Association's first set of rules, which were an early attempt by the former pupils of England's public schools, to unify the rules of their public schools games and create a universal and standardized set of rules for the game of football and bore little resemblance to the American game which would be developed in the following decades. It is still usually regarded as the first game of intercollegiate American football. The game was played at a Rutgers field. Two teams of 25 players attempted to score by kicking the ball into the opposing team's goal. Throwing or carrying the ball was not allowed, but there was plenty of physical contact between players. The first team to reach six goals was declared the winner. Rutgers won by a score of six to four. A rematch was played at Princeton a week later under Princeton's own set of rules (one notable difference was the awarding of a "free kick" to any player that caught the ball on the fly, which was a feature adopted from the Football Association's rules; the fair catch kick rule has survived through to modern American game). Princeton won that game by a score of 8–0. Columbia joined the series in 1870, and by 1872 several schools were fielding intercollegiate teams, including Yale and Stevens Institute of Technology. Rutgers was first to extend the reach of the game. An intercollegiate game was first played in the state of New York when Rutgers played Columbia on November 2, 1872. It was also the first scoreless tie in the history of the fledgling sport. Yale football started the same year and had its first match against Columbia, the nearest college to play football. It took place at Hamilton Park in New Haven and was the first game in New England. The game used a set of rules based on association football with 20-man sides, played on a field 400 by 250 feet. Yale wins 3-0, Tommy Sherman scoring the first goal and Lew Irwin the other two. Harvard refused to attend the rules conference organized by the other schools and continued to play under its own code. While Harvard's voluntary absence from the meeting made it hard for them to schedule games against other American universities, it agreed to a challenge to play McGill University, from Montreal, in a two-game series. Inasmuch as Rugby football had been transplanted to Canada from England, the McGill team played under a set of rules which allowed a player to pick up the ball and run with it whenever he wished. Another rule, unique to McGill, was to count tries (the act of grounding the football past the opposing team's goal line; it is important to note that there was no end zone during this time), as well as goals, in the scoring. In the Rugby rules of the time, a touchdown only provided the chance to kick a free goal from the field. If the kick was missed, the touchdown did not count. Harvard quickly took a liking to the rugby game, and its use of the try which, until that time, was not used in American football. 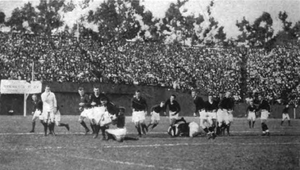 The try would later evolve into the score known as the touchdown. On June 4, 1875, Harvard faced Tufts University in the first game between two American colleges played under rules similar to the McGill/Harvard contest, which was won by Tufts . The rules included each side fielding 11 men at any given time, the ball was advanced by kicking or carrying it, and tackles of the ball carrier stopped play. Further elated by the excitement of McGill's version of football, Harvard challenged its closest rival, Yale, to which the Bulldogs accepted. The two teams agreed to play under a set of rules called the "Concessionary Rules", which involved Harvard conceding something to Yale's soccer and Yale conceding a great deal to Harvard's rugby. They decided to play with 15 players on each team. On November 13, 1875, Yale and Harvard played each other for the first time ever, where Harvard won 4-0. At the first The Game—the annual contest between Harvard and Yale, among the 2000 spectators attending the game that day, was the future "father of American football" Walter Camp. Walter, who would enroll at Yale the next year, was torn between an admiration for Harvard's style of play and the misery of the Yale defeat, and became determined to avenge Yale's defeat. Spectators from Princeton, also carried the game back home, where it quickly became the most popular version of football. Following the introduction of rugby-style rules to American football, Camp became a fixture at the Massasoit House conventions where rules were debated and changed. Dissatisfied with what seemed to him to be a disorganized mob, he proposed his first rule change at the first meeting he attended in 1878: a reduction from fifteen players to eleven. The motion was rejected at that time but passed in 1880. The effect was to open up the game and emphasize speed over strength. Camp's most famous change, the establishment of the line of scrimmage and the snap from center to quarterback, was also passed in 1880. Originally, the snap was executed with the foot of the center. Later changes made it possible to snap the ball with the hands, either through the air or by a direct hand-to-hand pass. Rugby league followed Camp's example, and in 1906 introduced the play-the-ball rule, which greatly resembled Camp's early scrimmage and center-snap rules. In 1966, Rugby league introduced a four-tackle rule based on Camp's early down-and-distance rules. The last, and arguably most important innovation, which would at last make American football uniquely "American", was the legalization of interference, or blocking, a tactic which was highly illegal under the rugby-style rules. Interference remains strictly illegal in both rugby codes to this day. The prohibition of interference in the rugby game stems from the game's strict enforcement of its offsides rule, which prohibited any player on the team with possession of the ball to loiter between the ball and the goal. At first, American players would find creative ways of aiding the runner by pretending to accidentally knock into defenders trying to tackle the runner. When Walter Camp witnessed this tactic being employed against his Yale team, he was at first appalled, but the next year had adopted the blocking tactics for his own team. During the 1880s and 1890s, teams developed increasingly complex blocking tactics including the interlocking interference technique known as the Flying wedge or "V-trick formation", which was developed by Lorin F. Deland and first introduced by Harvard in a collegiate game against Yale in 1892. Despite its effectiveness, it was outlawed two seasons later in 1894 through the efforts of the rule committee led by Parke H. Davis, because of its contribution to serious injury. Non-interlocking interference remains a basic element of modern American football, with many complex schemes being developed and implemented over the years, including zone blocking and pass blocking. On November 23, 1876, representatives from Harvard, Yale, Princeton, and Columbia met at the Massasoit House in Springfield, Massachusetts to standardize a new code of rules based on the rugby game first introduced to Harvard by McGill University in 1874. The rules were based largely on the Rugby Football Union's code from England, though one important difference was the replacement of a kicked goal with a touchdown as the primary means of scoring (a change that would later occur in rugby itself, favoring the try as the main scoring event). Three of the schools—Harvard, Columbia, and Princeton—formed the Intercollegiate Football Association, as a result of the meeting. Yale did not join the group until 1879, because of an early disagreement about the number of players per team. 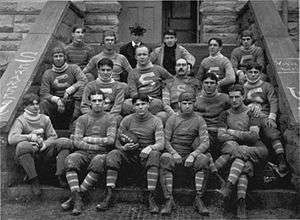 In 1879, the University of Michigan became the first school west of Pennsylvania to establish a college football team. On May 30, 1879 Michigan beat Racine College 1–0 in a game played in Chicago. The Chicago Daily Tribune called it "the first rugby-football game to be played west of the Alleghenies." Other Midwestern schools soon followed suit, including the University of Chicago, Northwestern University, and the University of Minnesota. 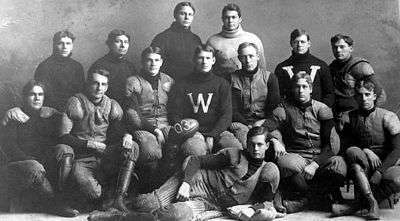 The first western team to travel east was the 1881 Michigan team, which played at Harvard, Yale and Princeton. The nation's first college football league, the Intercollegiate Conference of Faculty Representatives (also known as the Western Conference), a precursor to the Big Ten Conference, was founded in 1895. 1894 football game in Staunton, Virginia between VMI and Virginia Tech. Although the beginnings of the contemporary Southeastern Conference and Atlantic Coast Conference start in 1892. Upon organizing the first Auburn football team in that year, George Petrie arranged for the team to play the University of Georgia team at Piedmont Park in Atlanta, Georgia. Auburn won the game, 10–0, in front of 2,000 spectators. The game inaugurated what is known to college football fans as the Deep South's Oldest Rivalry. It was in 1994 the Southern Intercollegiate Athletic Association (SIAA) was founded on December 21, 1894, by Dr. William Dudley, a chemistry professor at Vanderbilt. The original members were Alabama, Auburn, Georgia, Georgia Tech, North Carolina, Sewanee, and Vanderbilt. Clemson, Cumberland, Kentucky, LSU, Mercer, Mississippi, Mississippi A&M (Mississippi State), Southwestern Presbyterian University, Tennessee, Texas, Tulane, and the University of Nashville joined the following year in 1895 as invited charter members. The conference was originally formed for "the development and purification of college athletics throughout the South". It is thought that the first forward pass in football occurred on October 26, 1895 in a game between Georgia and North Carolina when, out of desperation, the ball was thrown by the North Carolina back Joel Whitaker instead of punted and George Stephens caught the ball. On November 9, 1895 John Heisman executed a hidden ball trick utilizing quarterback Reynolds Tichenor to get Auburn's only touchdown in a 6 to 9 loss to Vanderbilt. It was the first game in the south decided by a field goal. 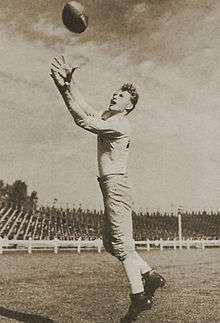 Heisman later used the trick against Pop Warner's Georgia team. Warner picked up the trick and later used it at Cornell against Penn State in 1897. He then used it in 1903 at Carlisle against Harvard and garnered national attention. In May 1900, Yost was hired as the football coach at Stanford University, and, after traveling home to West Virginia, he arrived in Palo Alto, California, on August 21, 1900. Yost led the 1900 Stanford team to a 7–2–1, outscoring opponents 154 to 20. The next year in 1901, Yost was hired by Charles A. Baird as the head football coach for the Michigan Wolverines football team. 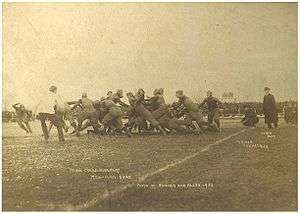 On 1 January 1902, Yost's dominating 1901 Michigan Wolverines football team agreed to play a 3–1–2 team from Stanford University in the inaugural "Tournament East-West football game what is now known as the Rose Bowl Game by a score of 49–0 after Stanford captain Ralph Fisher requested to quit with eight minutes remaining. In 1906, citing concerns about the violence in American Football, universities on the West Coast, led by California and Stanford, replaced the sport with rugby union. At the time, the future of American football was very much in doubt and these schools believed that rugby union would eventually be adopted nationwide. Other schools fllowed suit and also made the switch included Nevada, St. Mary's, Santa Clara, and USC (in 1911). However, due to the perception that West Coast football was inferior to the game played on the East Coast anyway, East Coast and Midwest teams shrugged off the loss of the teams and continued playing American football. With no nationwide movement, the available pool of rugby teams to play remained small. The schools scheduled games against local club teams and reached out to rugby union powers in Australia, New Zealand, and especially, due to its proximity, Canada. The annual Big Game between Stanford and California continued as rugby, with the winner invited by the British Columbia Rugby Union to a tournament in Vancouver over the Christmas holidays, with the winner of that tournament receiving the Cooper Keith Trophy. In 1906 Vanderbilt defeated Carlisle 4 to 0, the result of a Bob Blake field goal. In 1907 Vanderbilt fought Navy to a 6 to 6 tie. In 1910 Vanderbilt held defending national champion Yale to a scoreless tie. Tom Davies of Pittsburgh runs against undefeated and unscored upon Georgia Tech in the 1918 game at Forbes Field. Helping Georgia Tech's claim to a title in 1917, the Auburn Tigers held undefeated, Chic Harley led Big Ten champion Ohio State to a scoreless tie the week before Georgia Tech beat the Tigers 68 to 7. The next season, with many players gone due to World War I, a game was finally scheduled at Forbes Field with Pittsburgh. The Panthers, led by freshman Tom Davies, defeated Georgia Tech 32 to 0. Tech center Bum Day was the first player on a Southern team ever selected first-team All-American by Walter Camp. 1917 saw the rise of another Southern team in Centre of Danville, Kentucky. In 1921 Bo McMillin led Centre upset defending national champion Harvard 6 to 0 in what is widely considered one of the greatest upsets in college football history. The next year Vanderbilt fought Michigan to a scoreless tie at the inaugural game on Dudley Field, the first stadium in the South made exclusively for college football. Michigan coach Fielding Yost and Vanderbilt coach Dan McGugin were brothers-in-law, and the latter the protege of the former. The game featured the season's two best defenses and included a goal line stand by Vanderbilt to preserve the tie. Its result was "a great surprise to the sporting world." Commodore fans celebrated by throwing some 3,000 seat cushions onto the field. The game features prominently in Vanderbilt's history. That same year, Alabama upset Penn 9 to 7. Vanderbilt's line coach then was Wallace Wade, who in 1925 coached Alabama to the south's first Rose Bowl victory. This game is commonly referred to as "the game that changed the south." Wade followed up the next season with an undefeated record and Rose Bowl tie. Georgia's 1927 "dream and wonder team" defeated Yale for the first time. Georgia Tech, led by Heisman protege William Alexander, gave the dream and wonder team its only loss, and the next year were national and Rose Bowl champions. The Rose Bowl included Roy Riegels' wrong-way run. On October 12, 1929, Yale lost to Georgia in Sanford Stadium in its first trip to the south. Wade's Alabama again won a national championship and Rose Bowl in 1930. During World War II, college football players enlisted in the armed forces, some playing in Europe during the war. As most of these players had eligibility left on their college careers, some of them returned to college at West Point, bringing Army back-to-back national titles in 1944 and 1945 under coach Red Blaik. Doc Blanchard (known as "Mr. Inside") and Glenn Davis (known as "Mr. Outside") both won the Heisman Trophy, in 1945 and 1946 respectively. On the coaching staff of those 1944–1946 Army teams was future Pro Football Hall of Fame coach Vince Lombardi. The 1950s saw the rise of yet more dynasties and power programs. Oklahoma, under coach Bud Wilkinson, won three national titles (1950, 1955, 1956) and all ten Big Eight Conference championships in the decade while building a record 47-game winning streak. Woody Hayes led Ohio State to two national titles, in 1954 and 1957, and dominated the Big Ten conference, winning three Big Ten titles—more than any other school. Wilkinson and Hayes, along with Robert Neyland of Tennessee, oversaw a revival of the running game in the 1950s. Passing numbers dropped from an average of 18.9 attempts in 1951 to 13.6 attempts in 1955, while teams averaged just shy of 50 running plays per game. Nine out of ten Heisman trophy winners in the 1950s were runners. Notre Dame, one of the biggest passing teams of the decade, saw a substantial decline in success; the 1950s were the only decade between 1920 and 1990 when the team did not win at least a share of the national title. Paul Hornung, Notre Dame quarterback, did, however, win the Heisman in 1956, becoming the only player from a losing team ever to do so. Following the enormous success of the National Football League's 1958 championship game, college football no longer enjoyed the same popularity as the NFL, at least on a national level. While both games benefited from the advent of television, since the late 1950s, the NFL has become a nationally popular sport while college football has maintained strong regional ties. With the growth of bowl games, it became difficult to determine a national champion in a fair and equitable manner. As conferences became contractually bound to certain bowl games (a situation known as a tie-in), match-ups that guaranteed a consensus national champion became increasingly rare. In 1992, seven conferences and independent Notre Dame formed the Bowl Coalition, which attempted to arrange an annual No.1 versus No.2 matchup based on the final AP poll standings. The Coalition lasted for three years; however, several scheduling issues prevented much success; tie-ins still took precedence in several cases. For example, the Big Eight and SEC champions could never meet, since they were contractually bound to different bowl games. The coalition also excluded the Rose Bowl, arguably the most prestigious game in the nation, and two major conferences—the Pac-10 and Big Ten—meaning that it had limited success. In 1995, the Coalition was replaced by the Bowl Alliance, which reduced the number of bowl games to host a national championship game to three—the Fiesta, Sugar, and Orange Bowls—and the participating conferences to five—the ACC, SEC, Southwest, Big Eight, and Big East. It was agreed that the No.1 and No.2 ranked teams gave up their prior bowl tie-ins and were guaranteed to meet in the national championship game, which rotated between the three participating bowls. The system still did not include the Big Ten, Pac-10, or the Rose Bowl, and thus still lacked the legitimacy of a true national championship. In 1998, a new system was put into place called the Bowl Championship Series. For the first time, it included all major conferences (ACC, Big East, Big 12, Big Ten, Pac-10, and SEC) and all four major bowl games (Rose, Orange, Sugar and Fiesta). The champions of these six conferences, along with two "at-large" selections, were invited to play in the four bowl games. Each year, one of the four bowl games served as a national championship game. Also, a complex system of human polls, computer rankings, and strength of schedule calculations was instituted to rank schools. Based on this ranking system, the No.1 and No.2 teams met each year in the national championship game. Traditional tie-ins were maintained for schools and bowls not part of the national championship. For example, in years when not a part of the national championship, the Rose Bowl still hosted the Big Ten and Pac-10 champions. The system continued to change, as the formula for ranking teams was tweaked from year to year. At-large teams could be chosen from any of the Division I conferences, though only one selection—Utah in 2005—came from a non-BCS affiliated conference. Starting with the 2006 season, a fifth game—simply called the BCS National Championship Game—was added to the schedule, to be played at the site of one of the four BCS bowl games on a rotating basis, one week after the regular bowl game. This opened up the BCS to two additional at-large teams. Also, rules were changed to add the champions of five additional conferences (Conference USA, the Mid-American Conference, the Mountain West Conference, the Sun Belt Conference and the Western Athletic Conference), provided that said champion ranked in the top twelve in the final BCS rankings, or was within the top 16 of the BCS rankings and ranked higher than the champion of at least one of the "BCS conferences" (also known as "AQ" conferences, for Automatic Qualifying). Several times since this rule change was implemented, schools from non-AQ conferences have played in BCS bowl games. 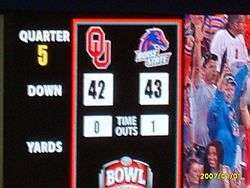 In 2009, Boise State played TCU in the Fiesta Bowl, the first time two schools from non-BCS conferences played each other in a BCS bowl game. The most recent team from the non-AQ ranks to reach a BCS bowl game was Northern Illinois in 2012, which played in (and lost) the 2013 Orange Bowl. Due to the intensification of the College football playoff debate after nearly a decade of the sometimes disputable results of the BCS, the conference commissioners and Notre Dame's president voted to implement a Plus-One system which was to be called the 'College Football Playoff'. The College Football Playoff is the annual postseason tournament for the NCAA Division I Football Bowl Subdivision (FBS) and just as its predecessors, has failed to receive sanctioning from the NCAA. The playoff began with the 2014 NCAA Division I FBS football season. Four teams play in two semifinal games, and the winners advance to the College Football Playoff National Championship game. The first season of the new system was not without controversy, however, after TCU and Baylor (both with only one loss) both failed to receive the support of the College Football Playoff selection committee. 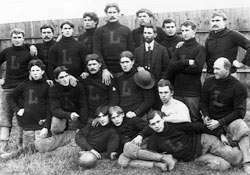 1897 Latrobe Athletic Association football team: The first entirely professional team to play an entire season. Charles Follis is believed to be the first black professional football player, having played for the Shelby Steamfitters from 1902 to 1906. Follis, a two sport athlete, was paid for his work beginning in 1904. From its inception in 1920 as a loose coalition of various regional teams, the American Professional Football Association had comparatively few African-American players; a total of nine black people suited up for NFL teams between 1920 and 1926, including future attorney, black activist, and internationally acclaimed artist Paul Robeson. Fritz Pollard and Bobby Marshall were the first black players in what is now the NFL in 1920. Pollard became the first black coach in 1921. In 1921, several more teams joined the league, increasing the membership to 22 teams. Among the new additions were the Green Bay Packers, which now has the record for longest use of an unchanged team name. Also in 1921, A. E. Staley, the owner of the Decatur Staleys, sold the team to player-coach George Halas, who went on to become one of the most important figures in the first half century of the NFL. In 1921, Halas moved the team to Chicago, but retained the Staleys nickname. In 1922 the team was renamed the Chicago Bears. The Staleys won the 1921 AFPA Championship, over the Buffalo All-Americans in an event later referred to as the "Staley Swindle". At the end of the 1932 season, the Chicago Bears and the Portsmouth Spartans were tied with the best regular-season records. To determine the champion, the league voted to hold its first playoff game. Because of cold weather, the game was held indoors at Chicago Stadium, which forced some temporary rule changes. Chicago won, 9–0. The playoff proved so popular that the league reorganized into two divisions for the 1933 season, with the winners advancing to a scheduled championship game. A number of new rule changes were also instituted: the goal posts were moved forward to the goal line, every play started from between the hash marks, and forward passes could originate from anywhere behind the line of scrimmage (instead of the previous five yards behind). In 1936, the NFL instituted the first draft of college players. With the first ever draft selection, the Philadelphia Eagles picked Heisman Trophy winner Jay Berwanger, but he declined to play professionally. Also in that year, another AFL formed, but it also lasted only two seasons. The 1930s represented an important time of transition for the NFL. League membership was fluid prior to the mid-1930s. 1936 was the first year where there were no franchise moves, prior to that year 51 teams had gone defunct. In 1941, the NFL named its first Commissioner, Elmer Layden. The new office replaced that of President. Layden held the job for five years, before being replaced by Pittsburgh Steelers co-owner Bert Bell in 1946. During World War II, a player shortage led to a shrinking of the league as several teams folded and others merged. Among the short-lived merged teams were the Steagles (Pittsburgh and Philadelphia) in 1943, the Card-Pitts (Chicago Cardinals and Pittsburgh) in 1944, and a team formed from the merger of the Brooklyn Dodgers and the Boston Yanks in 1945. 1946 was an important year in the history of professional football, as that was the year when the league reintegrated. The Los Angeles Rams signed two African American players, Kenny Washington and Woody Strode. Also that year, a competing league, the All-America Football Conference (AAFC), began operation. During the 1950s, additional teams entered the league. In 1950, the AAFC folded, and three teams from that league were absorbed into the NFL: the Cleveland Browns (who had won the AAFC Championship every year of the league's existence), the San Francisco 49ers, and the Baltimore Colts (not the same as the modern franchise, this version folded after one year). The remaining players were chosen by the now 13 NFL teams in a dispersal draft. Also in 1950, the Los Angeles Rams became the first team to televise its entire schedule, marking the beginning of an important relationship between television and professional football. In 1952, the Dallas Texans went defunct, becoming the last NFL franchise to do so. The following year a new Baltimore Colts franchise formed to take over the assets of the Texans. The players' union, known as the NFL Players Association, formed in 1956. At the conclusion of the 1958 NFL season, the Baltimore Colts and the New York Giants met at Yankee Stadium to determine the league champion. Tied after 60 minutes of play, it became the first NFL game to go into sudden death overtime. The final score was Baltimore Colts 23, New York Giants 17. The game has since become widely known as "the Greatest Game Ever Played". It was carried live on the NBC television network, and the national exposure it provided the league has been cited as a watershed moment in professional football history, helping propel the NFL to become one of the most popular sports leagues in the United States. Journalist Tex Maule said of the contest, "This, for the first time, was a truly epic game which inflamed the imagination of a national audience." In 1959, longtime NFL commissioner Bert Bell died of a heart attack while attending an Eagles/Steelers game at Franklin Field. That same year, Dallas, Texas businessman Lamar Hunt led the formation of the rival American Football League, the fourth such league to bear that name, with war hero and former South Dakota Governor Joe Foss as its Commissioner. Unlike the earlier rival leagues, and bolstered by television exposure, the AFL posed a significant threat to NFL dominance of the professional football world. With the exception of Los Angeles and New York, the AFL avoided placing teams in markets where they directly competed with established NFL franchises. In 1960, the AFL began play with eight teams and a double round-robin schedule of fourteen games. New NFL commissioner Pete Rozelle took office the same year. The AFL became a viable alternative to the NFL as it made a concerted effort to attract established talent away from the NFL, signing half of the NFL's first-round draft choices in 1960. The AFL worked hard to secure top college players, many from sources virtually untapped by the established league: small colleges and predominantly black colleges. Two of the eight coaches of the Original Eight AFL franchises, Hank Stram (Texans/Chiefs) and Sid Gillman (Chargers) eventually were inducted to the Hall of Fame. Led by Oakland Raiders owner and AFL commissioner Al Davis, the AFL established a "war chest" to entice top talent with higher pay than they got from the NFL. Former Green Bay Packers quarterback Babe Parilli became a star for the Boston Patriots during the early years of the AFL, and University of Alabama passer Joe Namath rejected the NFL to play for the New York Jets. Namath became the face of the league as it reached its height of popularity in the mid-1960s. Davis's methods worked, and in 1966, the junior league forced a partial merger with the NFL. The two leagues agreed to have a common draft and play in a common season-ending championship game, known as the AFL-NFL World Championship. Two years later, the game's name was changed to the Super Bowl. AFL teams won the next two Super Bowls, and in 1970, the two leagues merged to form a new 26-team league. The resulting newly expanded NFL eventually incorporated some of the innovations that led to the AFL's success, such as including names on player's jerseys, official scoreboard clocks, national television contracts (the addition of Monday Night Football gave the NFL broadcast rights on all of the Big Three television networks), and sharing of gate and broadcasting revenues between home and visiting teams. The NFL continued to grow, eventually adopting some innovations of the AFL, including the two-point conversion. It has expanded several times to its current 32-team membership, and the Super Bowl has become a cultural phenomena across the United States. One of the most popular televised events annually in the United States, it has become a major source of advertising revenue for the television networks that have carried it and it serves as a means for advertisers to debut elaborate and expensive commercials for their products. The NFL has grown to become the most popular spectator sports league in the United States. One of the things that have marked the modern NFL as different from other major professional sports leagues is the apparent parity between its 32 teams. While from time to time, dominant teams have arisen, the league has been cited as one of the few where every team has a realistic chance of winning the championship from year to year. The league's complex labor agreement with its players' union, which mandates a hard salary cap and revenue sharing between its clubs, prevents the richest teams from stockpiling the best players and gives even teams in smaller cities such as Green Bay and New Orleans the opportunity to compete for the Super Bowl. One of the chief architects of this labor agreement was former NFL commissioner Paul Tagliabue, who presided over the league from 1989 to 2006. In addition to providing parity between the clubs, the current labor contract, established in 1993 and renewed in 1998 and 2006, has kept player salaries low—the lowest among the four major league sports in the United States— and has helped make the NFL the only major American professional sports league since 1993 not to suffer any player strike or work stoppage. Since taking over as commissioner before the 2006 season, Roger Goodell has made player conduct a priority of his office. Since taking office, several high-profile players have experienced trouble with the law, from Adam "Pacman" Jones to Michael Vick. In these and other cases, Commissioner Goodell has mandated lengthy suspensions for players who fall outside of acceptable conduct limits. Goodell, however, has remained a largely unpopular figure to many of the league's fans, who perceive him attempting to change the NFL's identity and haphazardly damage the sport. Minor professional leagues such as the original United Football League, Atlantic Coast Football League, Seaboard Football League and Continental Football League existed in abundance in the 1960s and early 1970s, to varying degrees of success. Several other professional football leagues have been formed since the AFL–NFL merger, though none have had the success of the AFL. In 1974, the World Football League formed and was able to attract such stars as Larry Csonka away from the NFL with lucrative contracts. However, most of the WFL franchises were insolvent and the league folded in 1975; the Memphis Southmen, the team that had signed Csonka and the most financially stable of the teams, unsuccessfully sued to join the NFL. In 1970, Patricia Barzi Palinkas became the first woman to ever play on a men's semipro football team when she joined the Orlando Panthers of the Atlantic Coast league. In 1974, the National Women's Football League was founded, starting play with 7 teams. In 1982, the United States Football League formed as a spring league, and enjoyed moderate success during its first two seasons behind such stars as Jim Kelly and Herschel Walker. After its spring 1985 season, the league, which lost a considerable amount of money due to overspending on players, opted to gamble on moving its schedule to fall in 1986 and filing a billion-dollar antitrust lawsuit against the NFL and its television partners in an effort to stay afloat. When the lawsuit only drew a three-dollar judgment days before the fall 1986 season was to begin, the USFL folded. The NFL founded a developmental league known as the World League of American Football with teams based in the United States, Canada, and Europe. The WLAF ran for two years, from 1991 to 1992. Its successor, the all-European NFL Europe League, ran from 1995 to 2007. In 2001, the XFL was formed as a joint venture between the World Wrestling Federation and the NBC television network. It folded after one season in the face of rapidly declining fan interest and a poor reputation. However, XFL stars such as Tommy Maddox and Rod "He Hate Me" Smart later saw success in the NFL. The United Football League was a four-team fully professional league which played its first season in October–November 2009. The UFL was beset with numerous financial problems, some of which stemmed from the inability to sell television rights, insufficient ticket revenue and insurmountable expenses. Midway through its fourth season, the league abruptly shut down, after which several dozen former players and coaches sued to recover unpaid salaries; all remaining teams had folded and shut down their offices by March, 2013. The Fall Experimental Football League, which played two abbreviated seasons as an explicitly minor professional league in 2014 and 2015. Football is a popular participatory sport among youth. One of the earliest youth football organizations was founded in Philadelphia, in 1929, as the Junior Football Conference. Organizer Joe Tomlin started the league to provide activities and guidance for teenage boys who were vandalizing the factory he owned. The original four-team league expanded to sixteen teams in 1933 when Pop Warner, who had just been hired as the new coach of the Temple University football team, agreed to give a lecture to the boys in the league. In his honor, the league was renamed the Pop Warner Conference. Today, Pop Warner Little Scholars—as the program is now known—enrolls over 300,000 young boys and girls ages 5–16 in over 5000 football and cheerleading squads, and has affiliate programs in Mexico and Japan. Other organizations, such as the Police Athletic League, Upward, and the National Football League's NFL Youth Football Program also manage various youth football leagues. Football is a popular sport for high schools in the United States. The National Federation of State High School Associations (NFHS) was founded in 1920 as an umbrella organization for state-level organizations that manage high school sports, including high school football. The NFHS publishes the rules followed by most local high school football associations. More than 13,000 high schools participate in football, and in some places high school teams play in stadiums that rival college-level facilities. In Denton, Texas, for example, a 12,000 seat, $21,000,000 stadium hosts two local high school football teams. The growth of high school football and its impact on small town communities has been documented by landmark non-fiction works such as the 1990 book Friday Night Lights and the subsequent fictionalized film and television series. American football has been played outside the US since the 1920s and accelerated in popularity after World War II, especially in countries with large numbers of U.S. military personnel, who often formed a substantial proportion of the players and spectators. In 1998, the International Federation of American Football, was formed to coordinate international amateur competition. At present, 45 associations from the Americas, Europe, Asia and Oceania are organized within the IFAF, which claims to represent 23 million amateur athletes. The IFAF, which is based in Paris, France, organizes the quadrennial American Football World Cup. A long-term goal of the IFAF is for American football to be accepted by the International Olympic Committee as an Olympic sport. The only time that the sport was played was at the 1932 Summer Olympics in Los Angeles, but as a demonstration sport. Among the various problems the IFAF has to solve in order to be accepted by the IOC are building a competitive women's division, expanding the sport into Africa, and overcoming the current worldwide competitive imbalance that is in favor of American teams. Other codes of football share a common history with American football. Canadian football is a form of the game that evolved parallel to American football. While both games share a common history, there are some important differences between the two. A more modern sport that derives from American football is Arena football, designed to be played indoors inside of hockey or basketball arenas. The game was invented in 1981 by Jim Foster and the Arena Football League was founded in 1987 as the first major professional league to play the sport. Several other indoor football leagues have since been founded and continue to play today. 1 2 3 4 5 6 7 "Camp and His Followers: American Football 1876–1889" (PDF). The Journey to Camp: The Origins of American Football to 1889. Professional Football Researchers Association. Archived from the original (PDF) on June 13, 2010. Retrieved 2010-01-26. 1 2 3 4 5 6 "The History of Football". The History of Sports. Saperecom. 2007. Retrieved 2007-05-15. 1 2 3 4 5 6 7 8 9 "NFL History3039–1910". NFL.com. NFL Enterprises LLC. 2007. Retrieved 2007-05-15. ↑ Ray Schmidt (May 2004). "THE OLYMPICS GAME" (PDF). College Football Historical Society Newsletter. 1 2 "NFL:America's Choice" (PDF). National Football League. 2007. Archived from the original (PDF) on August 8, 2007. Retrieved 2007-08-15. ↑ "History of Football – Britain, the home of Football". FIFA. Retrieved 29 July 2013. 1 2 3 4 5 6 7 8 "No Christian End!" (PDF). The Journey to Camp: The Origins of American Football to 1889. Professional Football Researchers Association. Retrieved 2010-01-26. ↑ Meacham, Scott (2006). "Old Division Football, The Indigenous Mob Soccer Of Dartmouth College (pdf)" (PDF). dartmo.com. Retrieved 2007-05-16. ↑ "1800s". Rutgers Through The Years. Rutgers University. Archived from the original on January 20, 2007. Retrieved 2007-05-16. ↑ "The History of Walter Camp". The Walter Camp Foundation. Archived from the original on December 18, 2007. Retrieved 2008-01-16. • "History." 2009 Baylor Football Media Almanac. Baylor Athletics (Baylor University). Retrieved 2009-10-11. • The National Collegiate Athletic Association. "Section 11—Extra Points." 2008 Football Statisticians' Manual. August 2008. Retrieved 2009-10-11. • Professional Football Researchers Association. "Yale's Walter Camp and 1870s Rugby." The Journey to Camp: The Origins of American Football to 1889. Ivy League Rugby Conference (2009-01-31). Retrieved 2009-10-11. • Johnson, Greg (2008-08-28). "Two-point conversion turns 50." The NCAA News. Retrieved 2009-10-11. • "NFL History by Decade: 1869–1910." National Football League. Retrieved 2009-10-11. ↑ "Harvard Football Timeline". TheGame.org. Harvard University Sports Information Office. Retrieved 2009-02-18. ↑ "Big Ten History". Big Ten Conference – Official Athletic Site – Traditions. 2007. Retrieved 2007-05-19. ↑ John Majors. "College Football". Tennessee Historical Society. Retrieved 2006-11-29. ↑ Southern Inter-Collegiate Athletic Association (PDF). Athens, Georgia: E. D. Stone. 1895. Retrieved 13 October 2011. ↑ Migdol, Gary (1997). Stanford: Home of Champions. Sports Publishing LLC. pp. 11–13. ISBN 1-57167-116-1. Retrieved May 6, 2014. ↑ A Ghastly Holocaust: Football Spectators Plunged into Molten Glass, The (Adelaide) Advertiser, (Friday 11 January 1901), p.6. ↑ Twenty Score Persons Make Awful Plunge: Seventeen People Meet Most Awful Death: Two San Jose Men Die Amid Sizzling Shrieking Human Mass in Collapsed Factory at Big Game, The (San Jose) Evening News, (Friday 30 November 1900), p.1, p.5. ↑ Through a Roof to Death, The (Crawfordsville) Daily News-Review, (Friday, 30 November 1900), p.2. ↑ Spectators Fell Into Molten Glass: Thirteen Dead, One Hundred Injured by Collapse of a Roof Overlooking the Stanford-Berkeley Game at San Francisco, The (Spokane) Spokesman-Review, (Friday 30 November 1900), p.1. ↑ Death Reaps a Dread Harvest of Lives and Plunges City into Gloom, The San Francisco Call, (Friday, 30 November 1900), p.2. ↑ Eskanazi, J., "Sudden Death: Boys Fell to Their Doom in S.F. 's Forgotten Disaster", San Francisco Weekly News, 15 August 2012. 1 2 3 4 5 6 Park, Roberta J (Winter 1984). "From Football to Rugby—and Back, 1906–1919: The University of California–Stanford University Response to the "Football Crisis of 1905"" (PDF). Journal of Sport History. 11 (3): 33. ↑ "The History of the NCAA". NCAA.org. National Collegiate Athletic Association. Archived from the original on April 30, 2007. Retrieved 2007-05-19. 1 2 3 "NFL History 1911–1920". NFL.com. NFL Enterprises LLC. 2007. Retrieved 2007-05-15. ↑ Sciullo Jr, Sam, ed. (1991). 1991 Pitt Football: University of Pittsburgh Football Media Guide. Pittsburgh: University of Pittsburgh Sports Information Office. p. 116. ↑ "The Football Game That Changed the South". The University of Alabama. Retrieved 2008-10-06. ↑ "A Look Back at the Southwest Conference". 2006–2007 Texas Almanac. The Dallas Morning News. 2007. Retrieved 2007-05-31. ↑ Ours, Robert M. (2007). "Southeastern Conference". College Football Encyclopedia. Augusta Computer Services. Archived from the original on May 10, 2007. Retrieved 2007-05-31. ↑ "A Brief History of the Heisman Trophy". Heisman Trophy. heisman.com. 2007. Archived from the original on December 5, 2009. Retrieved 2007-05-31. ↑ Barnidge, Tom (2000). "1958 Colts remember the 'Greatest Game'". nfl.com. Archived from the original on June 24, 2007. Retrieved 2007-03-21. reprinted from Official Super Bowl XXXIII Game Program. 1 2 Call, Jeff (December 20, 2006). "Changing seasons: Y. reconnects with past, but bowl scene not the same". Deseret News. p. D5. 1 2 "College Bowl Games". Hickok Sports. 2006. Archived from the original on January 28, 2007. Retrieved 2007-06-01. ↑ Celizic, Mike (December 9, 2006). "Too many bowl games? Nonsense". MSNBC. Archived from the original on January 29, 2007. Retrieved 2007-06-01. 1 2 3 "BCS Chronology". FOX Sports on MSN. 2006. Archived from the original on September 15, 2007. Retrieved 2007-06-01. ↑ McMurphy, Brett (April 24, 2013). "Football playoff has name and site". ESPN. Retrieved April 24, 2013. ↑ Wolken, Dan (April 25, 2013). "Questions and answers for the College Football Playoff". USA Today. Retrieved April 25, 2013. ↑ "History: The Birth of Pro Football". Pro Football Hall of Fame. Archived from the original on November 16, 2006. Retrieved 2007-06-05. ↑ "Heffelfinger, "Pudge" (William W.)". Sports Biographies. HickokSports.com. 2004. Archived from the original on April 16, 2007. Retrieved 2007-06-05. ↑ PFRA Research. "Ten Dollars and Cakes: The "Not Quite" First Pro: 1895" (PDF). Coffin Corner. Professional Football Researchers Association: 1–5. Archived from the original (PDF) on March 25, 2011. ↑ PFRA Research. "The Worst Season Ever, Pittsburgh Pro Teams Find Hard Times: 1900" (PDF). Coffin Corner. Professional Football Researchers Association (Annual): 1–2. Archived from the original (PDF) on December 15, 2010. ↑ Carroll, Bob (1980). "Dave Berry and the Philadelphia Story" (PDF). Coffin Corner. Professional Football Researchers Association. 2 (Annual): 1–9. Archived from the original (PDF) on December 15, 2010. ↑ Carroll, Bob (1980). "The First Football World Series" (PDF). Coffin Corner. Professional Football Researchers Association. 2 (Annual): 1–8. Archived from the original (PDF) on December 15, 2010. ↑ "Blondy Wallace and the Biggest Football Scandal Ever" (PDF). PFRA Annual. Professional Football Researchers Association. 5: 1–16. 1984. Archived from the original (PDF) on December 15, 2010. 1 2 3 4 Hickok, Ralph (2004). "NFL Franchise Chronology". HickokSports.com. Archived from the original on March 14, 2007. Retrieved 2007-06-05. 1 2 "NFL History 1921–1930". NFL.com. NFL Enterprises LLC. 2007. Retrieved 2007-06-05. ↑ "Who really won the championship in 1921? (p/o "History of Professional Football in Western New York")". Retrieved 2007-10-02. Since there were no championship games in 1921, the championship was once again decided by a vote of the Association's executive committee in January 1922. The executive committee ruled that the Chicago Staleys were the champions, based on the generally accepted rule that if two teams play each other more than once in a season, the second game counts more than the first. Buffalo and Chicago played on Thanksgiving Day, with Buffalo winning 7–6. The second game was held December 4. This time, Chicago won 10–7. Buffalo claimed that the second game was just a post-season "exhibition" game, and it should not count in the final standings. Chicago claimed that the Association did not have a set date for the end of the season, therefore the second game could not have been held in the "post-season." ↑ Chris Willis (2003). "Joe Carr VisionU" (PDF). Coffin Corner. Professional Football Researchers Association. 25 (5): 1–3. Archived from the original (PDF) on December 15, 2010. ↑ "History 1931–1940". NFL.com. NFL Enterprises LLC. 2007. Archived from the original on September 27, 2007. Retrieved 2007-10-12. ↑ Hickok, Ralph (2004). "The 1932 NFL Championship Game". HickokSports.com. Archived from the original on June 3, 2007. Retrieved 2007-06-05. ↑ "NFL History 1931–1940". NFL.com. NFL Enterprises LLC. 2007. Retrieved 2007-06-05. 1 2 3 4 "NFL History 1941–1950". NFL.com. NFL Enterprises LLC. 2007. Retrieved 2007-06-06. 1 2 3 "NFL History 1951–1960". NFL.com. NFL Enterprises LLC. 2007. Retrieved 2007-06-06. ↑ Barnidge, Tom. "1958 Colts remember the 'Greatest Game'". nfl.com, reprinted from Official Super Bowl XXXIII Game Program. Archived from the original on June 24, 2007. Retrieved 2007-06-26. 1 2 "NFL History 1961–1970". NFL.com. NFL Enterprises LLC. 2007. Retrieved 2007-06-26. ↑ "Remember the AFL". American Football League Hall of Fame. 2003. Retrieved 2007-06-26. ↑ "History of the Super Bowl". SuperNFL.com. Archived from the original on June 8, 2007. Retrieved 2007-06-26. ↑ La Monica, Paul R. (January 3, 2007). "Super prices for Super Bowl ads". CNN Money. Cable News Network LP, LLLP. Retrieved 2007-06-26. ↑ "NFL Sets Paid Attendance Record". NFL.com. NFL Enterprises LLC. 2007. Archived from the original on January 11, 2007. Retrieved 2007-06-26. ↑ Roddenberry, Sam (2001). "The Joys of parity". The Harvard Independent. Archived from the original on August 6, 2007. Retrieved 2007-09-06. ↑ Landsburg, Steven E. (June 23, 2000). "The NFL's Parity Perplex". Slate.com. Retrieved 2007-09-06. ↑ "Paul Tagliabue 1989–2006". NFL Commissioners. Tank Productions. 2007. Retrieved 2007-09-06. ↑ Paciella, Joe (August 22, 2007). "NFL Player Salaries for 2007". Doc's Sports Service. Retrieved 2007-09-06. ↑ "Collective Bargaining Agreement Between The NFL Management Council And The NFL Players Association, As amended March 8, 2006". nflpa.org. Retrieved 2007-04-20. ↑ Pasquarelli, Len (March 22, 2007). "Expect Goodell to crack down on poor behavior". ESPN Internet Ventures. Retrieved 2007-09-06. ↑ "Saints 'bountygate' suspensions: Is Roger Goodell fighting football itself?". CSMonitor.com. Retrieved 2012-10-22. ↑ "Has Roger Goodell Lost His Grip on Reality?". The700level.com. 2012-03-27. Retrieved 2012-10-22. ↑ Le Batard, Dan (April 8, 2012). "NFL's Roger Goodell cares more for cash than safety". The Miami Herald. ↑ "NFL Europe homepage". World League Licensing LLC. 2007. Retrieved 2007-07-02. ↑ "NFL History 1971–1980". NFL.com. NFL Enterprises LLC. 2007. Archived from the original on April 2, 2007. Retrieved 2007-06-26. ↑ "History of the USFL". Our Sports Central. Retrieved 2007-06-26. ↑ Boehlert, Eric (2001). "XFL makes history!". Salon Arts and Entertainment. Salon.com. Archived from the original on December 1, 2004. Retrieved 2007-06-26. 1 2 "Amateur Football History Timeline". History of the Sport. USA Football Inc. 2007. Archived from the original on August 18, 2007. Retrieved 2007-09-17. 1 2 "Pop Warner History". popwarner.com. 2007. Archived from the original on October 2, 2007. Retrieved 2007-09-17. ↑ "National PAL's Partners". National Association of Police Athletic/Activities Leagues, Inc. 2006. Retrieved 2007-09-17. ↑ "Upward Programs, General Information, and Resources". Upward Unlimited. 2007. Archived from the original on September 11, 2007. Retrieved 2007-09-17. ↑ "NFL Youth Football". NFL Enterprises LP. 2004. Retrieved 2007-09-17. ↑ "About Us". National Federation of State High School Associations. National Federation of State High School Associations. 2004. Archived from the original on August 30, 2007. Retrieved 2007-08-19. ↑ Wieberg, Steve (October 6, 2004). "Millions of dollars pour into high school football". USA Today. Retrieved 2007-09-18. ↑ Subramanian, Ram (2004). "book review of Friday Night Lights: A Town, A Team, and a Dream". curledup.com. Retrieved 2007-09-18. ↑ International Federation of American Football, 2004, "IFAF" Access date: October 12, 2007. ↑ Mike Florio (February 24, 2010). "Football not truly global until it's in Olympics". MSNBC. Archived from the original on February 27, 2010. Retrieved 2010-02-27. ↑ Vacchiano, Ralph (March 2, 2010). "Olympic organizers huddle over football's future at Games". New York Daily News. Retrieved 2010-03-13. ↑ "A Brief History of Football Canada". Football Canada. 2007. Archived from the original on August 25, 2007. Retrieved 2007-07-02. ↑ "History of Arena Football". HickokSports.com. 2006. Archived from the original on June 9, 2007. Retrieved 2007-07-02. ↑ Fagan, Sean (2004). "The Rugby Divide of 1895". RL1895.com. Retrieved 2007-07-02.